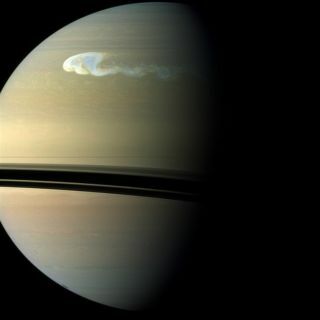 An image of Saturn taken in December 2010 by the Cassini spacecraft shows a storm with a latitudinal and longitudinal extent of 10,000 km and 17,000 km, respectively. The latitudinal extent of the storm’s head is approximately the distance from London to Cape Town. A "tail" emerging from its southern edge extends further eastward. The Great White Spot on Saturn has been imaged in unprecedented detail and is now yielding clues to how this titanic storm may have formed far earlier than scientists expected. The staggeringly powerful thunderstorm is approximately 6,200 miles (10,000 kilometers) wide, nearly as wide as Earth, and has a tail of white clouds that encircles all of Saturn. The storm began forming in the ringed planet's northern hemisphere in December. This is about 10 years early for Great White Spots, which usually recur about every 30 Earth years, when Saturn's northern hemisphere tilts most toward the sun. Only five similar Great White Spots have been observed in the past 135 years. The Great White Spot is a massive complex of thunderstorms. Radio waves emitted by electrical discharges there reveal intense and nearly continuous lightning that, at the peak of the storm, can flash 10 times or more per second. A key mystery regarding Great White Spots is where they get their energy from. Since the spots seem to occur seasonally, researchers had suggested they might be powered by the sun. However, peering into this latest Great White Spot revealed its cloud patterns make sense only if winds "extend deep into the 'weather layer' — a 250-kilometer-thick [155 miles] layer where the main clouds reside, where sunlight does not arrive," researcher Agustin Sánchez-Lavega, a planetary scientist at Higher Technical School of Engineering of Bilbao in Spain, told SPACE.com. "This points to the action of an internal heat source as the power for the winds." Still, questions remain as to how solar heat might help trigger such gigantic storms. One possibility is that energy from the sun triggers atmospheric changes that directly influence the upward flow of heat from deep within Saturn, researchers say. The researchers detailed their findings in the July 7 issue of the journal Nature.